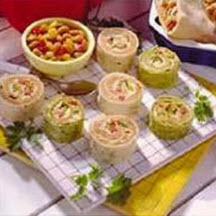 These delightful southwestern-style pinwheels, are filled with pepper Jack cheese, beans, and red bell peppers. Drain beans, spoon into bowl and mash with a potato masher. Spread half the bean mixture on one side of each tortilla to within 1/2-inch of edges. Sprinkle half the cheese over the beans on each. Place half of the red and green pepper strips along one edge of each tortilla. Roll tortilla tightly around peppers; repeat with second tortilla. Wrap in plastic wrap; refrigerate several hours or overnight. When ready to serve, slice about 1-inch off each end of tortillas. Slice remaining portion of tortilla roll into approximately 15 slices each. Serve with salsa for dipping, if desired.